Obelia is the primary genus of widely distributed animals belonging to the phylum Cnidiria. Members of Obelia must complete two generations, each with its own form and set of behaviors, in order to finish a single life cycle. Members of the first generation of Obelia exist as branching stalk-like polyps that live in colonies. Through filaments, Obelia attach to various surfaces, most often the ocean floor, but sometimes seaweed, shells or wharves. 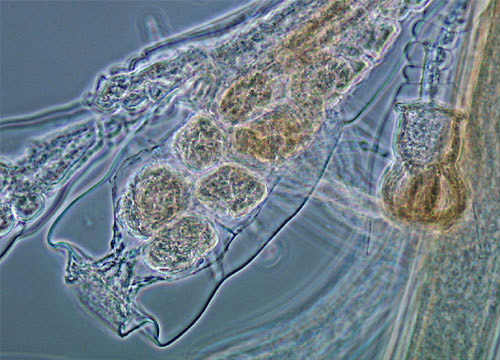 Reproduction of Obelia in this life stage occurs by budding, new polyps growing and breaking away to become members of the increasingly larger colony. Two different types of polyps exist together in the colonies of Obelia, each serving different primary purposes. The role of gastrozooids, which have mouths surrounded by tentacles tipped with stinging cells, is to capture and consume food. The reproductive duties, however, belong to the gonzooids, which create the successive generation, small jellyfish known as medusae, via budding. When the young medusae swim away from their parent gonzooids, the second generation truly begins. The umbrella shaped creatures have tentacles covered in nematocysts and suctorial pads that assist in capturing prey. 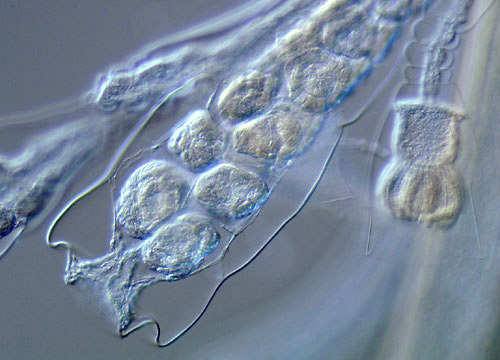 Reproduction of Obelia medusae occurs sexually, eggs and sperm uniting to become small larvae surrounded by cilia. Although, beginning as a free moving individual, the larvae eventually settle, each one becoming the founding member of a new polyp colony.